• a certificate of authenticity to certify that your stone is 100% natural, genuine and contains no dyes or toxic chemicals. Each stone is carved and polished in accordance with recognized industry quality standard and is guaranteed for its high quality and workmanship in Canada. 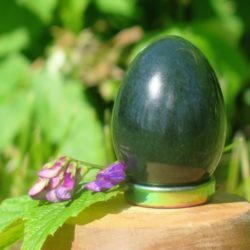 The Yoni Pleasure Egg is an ancient Taoist physical and spiritual practice to maintain the health of your yoni, womb, feminine energy and sexuality. 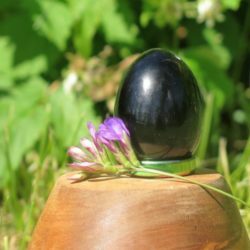 Once you have learned & become comfortable with your Yoni Pleasure Egg practice, I highly recommend reading my teacher Minke de Vos’ book “Tao Tantric Arts for Women” to support you in deepening your personal practice. During your menstrual cycle, it is recommended that you refrain from using your Yoni Egg as it can increase the flow of menstrual blood. Contact me to arrange for payment and shipping of your Yoni Egg. • continue to enhance your pleasure & open you even deeper in sacred union with your beloved and/or The Beloved. I encourage you to treat yourself to my Sacred Pleasure Path Program. 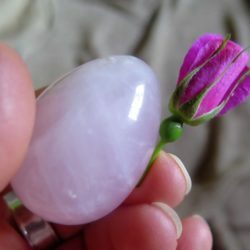 It is a 6 Session Intensive Masterclass (group sessions in Edmonton or private one on one available thru Skype ~ see events) that ensures that you have a positive, healing and successful experience with your Jade Yoni Egg rather than trying to learn alone from a book or online without immediate support. I tried to learn from a book and online and was left feeling very frustrated. During my 6 week Sacred Femininity Teacher Training in Thailand with Tao Tantric Arts, I learned a 6 session program to share with women who want to heal and awaken their sexual energy.